HBO has gone to no trouble to conceal the identity of the director tapped to lead its filmmaking docu-series Project Greenlight, now back for a fourth season after a decade-long hiatus. Common courtesy demands withholding that information, especially as Greenlight’s season premiere finds executive producers Ben Affleck, Matt Damon, and their production brain trust getting acquainted with the finalists and debating their respective merits. The winning director’s official reveal comes toward the end of the episode, but for anyone with a basic grasp of reality storytelling, the reveal will come the minute he sits down for his final interview. The conversation is so awkward, uneasy, and borderline combative, why wouldn’t they give him the job? Affleck and Damon select the most ornery candidate as if to make a good-faith gesture to those wondering if Greenlight has changed significantly in its 10 years off the air. The show returns essentially the same as it ever was: a reality show documenting the production of a film, with a far greater investment in the contentious process than the final product. The participants talk almost exclusively about creating the egg—this season, it’s Greenlight’s first comedy feature—but there’s never any confusion that the chicken comes first. The director is chosen for his talent, but he unquestionably outfoxed his competition by being the prima donna most likely to yield a series-length Overnight or Hearts Of Darkness. The emphasis on instigating drama may cheapen the historically high-minded Greenlight for its fans, but it’s got the same sturdy bones. From its inception, Greenlight has married the conflict-hungry conventions of a reality competition with the narrative discipline and naturalistic look of a reputable documentary. Then as now, it’s the perfect approach to developing a reality format for HBO, the standard bearer of salacious drama lacquered with pay-cable prestige. That said, Greenlight has lost some of its earnestness and ambition, which ultimately works to its benefit. 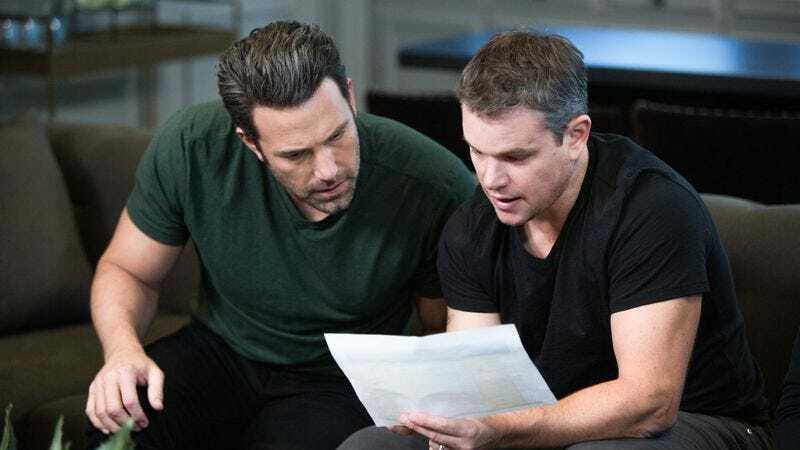 In previous seasons, Affleck and Damon have chosen inexperienced directors and screenwriters to collaborate on a movie with the theoretical, lofty goal of major distribution and a box-office windfall. With Affleck and Damon’s imprimatur and the show as a built-in ad campaign, Greenlight films were expected to be successes in their own right. Yet all three films to come out of Greenlight—2002’s Stolen Summer, 2003’s The Battle Of Shaker Heights, and 2005’s Feast—were critically brutalized and fell well short of recouping their bare-bones budgets. Each failed feature damned Greenlight more, a consequence of being among the first reality competitions on the air. But the show is returning to an evolved audience, one that no longer cares if the betrothed couple from The Bachelor makes it to the altar, or if America’s Next Top Model goes on to land the cover of Vogue. The journey acquits the destination. Affleck and Damon have tweaked Greenlight accordingly, scuttling the theatrical release in favor of an HBO premiere and nixing the screenwriter component altogether. The new and slightly improved Greenlight is solely about a novice director struggling to defend his creative vision against the practical constraints threatening it. The chosen director is ideal for that role, having completed film school too recently to understand the width of the gap between the theory of film and the practice of making one. He’s a rigid auteur whose niche sensibility and reluctance to embrace the material—a broad comedy script called Not Another Pretty Woman—are instant red flags for Bobby Farrelly of The Farrelly Brothers (both Farrellys will serve as consultants and directorial mentors). He bombs his interview in the way a Greenlight director is supposed to. After he leaves the room, the team debates his willingness to take the job more than his ability to do it. Making good on the narrative promise he shows in his interview, the director pulls Affleck and Damon aside to list his exacting demands for the film the moment they step off the dais after announcing his selection. Among those demands is permission to fire a key member of the creative team, sight unseen, and replace the person with a collaborator of his own choosing. He also insists on shooting on film despite the burden it would put on the film’s meager $3 million budget. The higher-ups quickly pledge their devotion to the director’s creative vision, but their position on whether he’s a determined maverick or an impudent snob depends on when they’re asked. No one’s opinion of him vacillates more than that of Effie Brown, the conscientious line producer forced to resort to tough love when her charm offensive proves ineffective. Brown is Greenlight’s ace in the hole. She has tremendous screen presence and frequently acts as a proxy for an audience likely to be turned off by the director’s film-school fussiness. She’s entirely unmoved, for example, when he begins casually discussing celluloid’s anti-halation layer. Greenlight is better than it’s ever been, but its claim to the title of best filmmaking reality show has been usurped. That distinction now belongs to Starz’s The Chair, based on a concept by Chris Moore, who went his own way after three seasons working beside Affleck and Damon as a Greenlight executive producer. The Chair follows two directors working independently on their wildly different interpretations of the same screenplay, and the films are judged against each other with a $250,000 cash prize at stake. It excels by going even further with the same idea reflected in the reconsitituted Greenlight, the idea that a candid peek into the creative process is valuable even if the final product is disposable. Make no mistake: The audience may stay for the film, but they’re coming to watch the coronation of America’s Next Top Persnickety Cineaste. Reviews by Scott Von Doviak will run weekly.